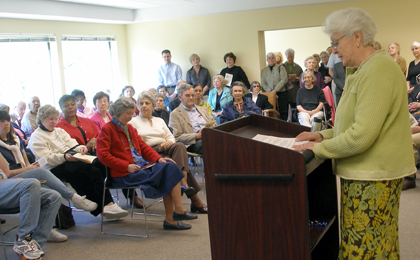 IT FEELS LIKE HOME: Sheila Berkelhammer, president of the Princeton Community Housing board of trustees, addresses an estimated 100 people in attendance Sunday honoring the opening of the Harriet Bryan House, formerly known as Elm Court II. The new 67-unit subsidized housing facility is the sister building to the 88-unit Elm Court, which opened in 1985. Sunday was declared "Harriet Bryan Day," honoring Ms. Bryan's efforts to increase affordable housing levels in Princeton. Ms. Bryan, first on the left in the front row, was in attendance to accept a proclamation delivered by Princeton Borough Mayor Mildred Trotman. Nearly 10 years after a housing plan submitted to the joint-municipal planning department sparked a philosophical, environmental, and developmental debate over market rate housing for senior citizens, the Princeton Regional Planning Board Thursday night approved a plan that will be viewed as a positive start for housing advocates. At last week's meeting of the Princeton Regional Schools Board of Education, Tuesday, April 24, board secretary Stephanie Kennedy administered the oath of office to newly elected member for Princeton Township Dorothy Bedford and to returning members JoAnn Cunningham and Alan Hegedus, representing Princeton Township and Princeton Borough, respectively. More than a decade after a little piece of undesirable land in a remote corner of Princeton Borough near the Princeton Township border was identified as potentially developable for senior housing, residents of Elm Court II were welcomed to their new home Sunday. As the ribbon was cut, those involved with the project reminisced, and Princeton, for some, became a whole lot easier to live in. While this Sunday, May 13, will provide an occasion for the entire nation to celebrate the special attributes of mothers, Mother's Day is but a single day in the year. What of the other 364? A missing person investigation that locked down Johnson Park Elementary School on Rosedale Road in Princeton Township last Tuesday resulted in the grim discovery of a 46-year-old Lawrence Township woman: the result of an apparent suicide that may have been occasioned by a failed relationship. It's not the sort of public reaction normally expected for a scientific article, but a joint paper by mathematician Robert D. MacPherson and physicist David J. Srolovitz has sparked a good deal of comment in the British press after its recent publication in the scientific journal Nature. As a kid growing up on Hodge Road in Princeton Borough, Whitney Hayes often dreamed of stepping on the field across town for the Princeton University men's lacrosse team. It was an emotional rollercoaster for Kathleen Miller last Sunday as she played in her last home game for the Princeton University women's lacrosse team. Even though the Princeton High girls' lacrosse team won six of its first nine games, PHS senior star Allegra Formento recognized that the squad has been plagued by lapses in focus. Patricia Rhodes is Princeton through and through. Born in the Princeton hospital in 1947, she attended the Nassau Street School and then the Witherspoon School from sixth to eighth grade. That was back in the days when Howard B. Waxwood Jr. was principal and Larry Ivan, who has managed the Community Park pool for more than three decades, was teaching. After graduating from Princeton High School in 1965, she married Ralph Jackson, her high school sweetheart, and the young couple moved to Chicago so that Ralph could become an apprentice pharmacist in his uncle's pharmacy. The best and the brightest; the coolest and the hottest; the most energy-efficient  all you need to make your kitchen and laundry room up-to-date and full-functioning is available at H & H Appliance. Located at 80 North Main Street in Windsor, this 60-year-old family business specializes in a full range of appliances with a wide price range. Quality, style, and attention to detail have always distinguished Nick Hilton Princeton, the men's store at 221 Witherspoon Street. Now, the same description can be applied to the new women's lines.